“Don’t judge a book by its cover.” I avoided making this quip when I reviewed the author’s previous adventure, because it would have been crude in a negative review. And here I am again, fallen for a pretty cover hook, line and sinker. But what a cover it is! One of the best and most visually striking I have seen in old-school gaming – sure, a lot of artists are more technically adept, but when it comes to evoking an air of mystery and adventure, this rendition of a cavern framed by red limestone formations is perfect at what it sets out to do. 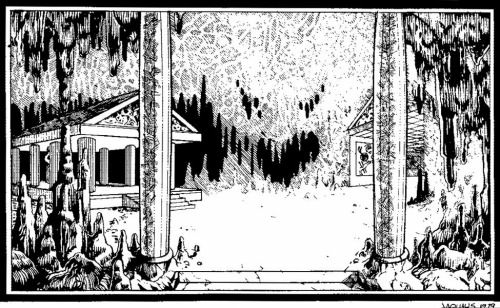 It recalls Thracia without aping it, and it is bold in that same Judges Guild style. 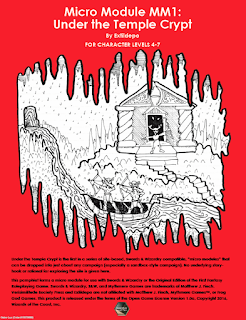 Under the Temple Crypt is a short “micro module” for Swords&Wizardry, designed for utility and sold for all of a buck. As the cover states, “No underlying story-hook or rational [sic] for exploring the site is given here.” This was a good decision. 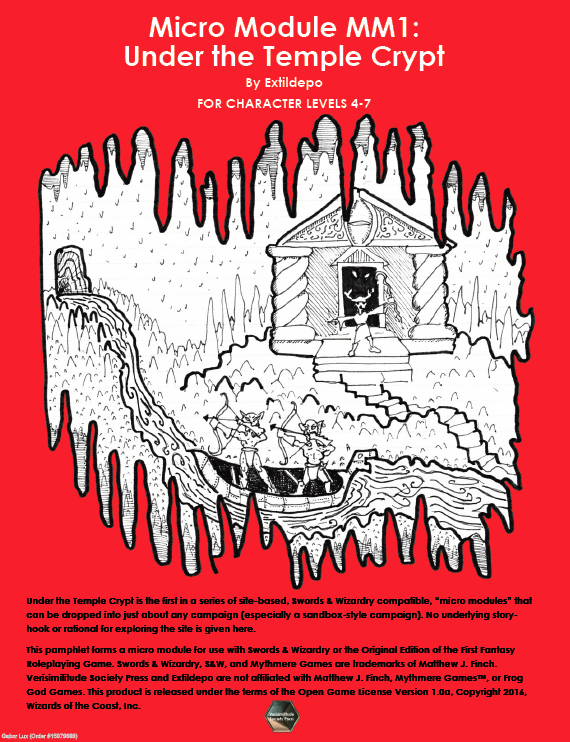 Tyranny of the Black Tower was suffering from a surfeit of underwhelming background detail; Under the Temple Crypt scraps the explanations and focuses on the content, presenting a well-rounded, 23-area dungeon level in 5 pages. This is the threshold where mini-dungeons become interesting and transcend simple monster lairs. The crypt in the title is only the starting point, leading into a mixture of ruins and caverns. The ruins are the remains of an ancient city drawing on Imperial Roman imagery; it is not a large one, but it captures D&D’s combined fascination with archaeology and tomb-robbing. As an interesting dynamic element, the random encounter chart treats it as a very unstable place which is currently in the process of collapsing upon itself, adding a sense of urgency to the company’s investigations. One of the module’s most fun traps (area L, exploiting the company’s greed and curiosity) also builds on this unstable quality. Most of the challenge comes from the cavern’s current monster inhabitants; the rooms are largely a mixture of descriptive detail and monster lairs. I could live with a few more tricks, traps and enigmas, but all in all, it is quite successful. Some of the treasure is cleverly hidden without resorting to pixel-hunting, there are combat encounters which are bound to be memorable due to their setup or location (the scene on the cover is just one of them), and the place has a good, organic feel with an air of mystery. No cover saves a bad adventure, but Under the Temple Crypt does not need saving. It is a marked improvement over Tyranny of the Black Tower, exactly the kind of solid, meat-and-potatoes adventure I expected more of from old-school gaming. I would like to see more of this series.